I did it!!! 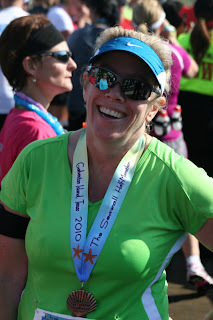 I ran my first half marathon and have the medal, the pretty, pretty medal, to prove it! Want to see a close up? I love it! 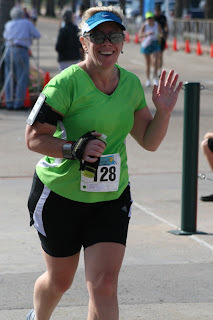 Kelly was right when she picked this race out for us - she said that their website was really pretty and the medals were bound to be nice...it's perfect! OK, onto the recap. If you recall, I declared my intention to run this race back in May. I started formally training for it the end of August, when I joined my running club. I was prepared, thanks to both the running club and the guidance from my running guru, Helen...but one thing that I had no control over was the weather - and boy, was it a hot one on Saturday. Late November in south Texas - it was 67 degrees and the humidity was running high. The race started about 20 minutes late - we were far enough back from the starting line to not know what was going on, but Jeff was up front and later said it looked like they were having trouble with the timing electronics. All I know is that it was getting hotter and the mosquitoes were biting and I wanted to start running, hopefully away from them! Finally about 7:50 am we started - woohoo, my first half marathon!!! 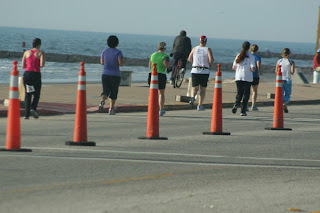 I love this picture of the runners snaking along the course...and the really cool thing? Both Jenny and I noticed it - as soon as we started running, you could hear the quiet pounding of hundreds and hundreds of footsteps - it was breathtaking, listening to all of us run. The course had us doing a loop through "Beach Town" - it was about 3.5 miles, I think. 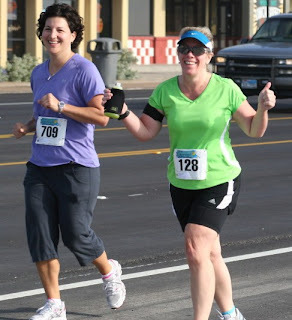 You'll have to forgive me - I have runner's brain bad right now (couple that with C.R.S. and there isn't much hope for accuracy at this point, lol) so I may not be remembering things exactly. Anyway, I was running pretty steady for that part. Just after mile 3 I tried to eat my first Shot Blok, but my stomach wasn't doing well and I couldn't bring myself to chew it...I ended up spitting it out. I was carrying my handheld water bottle and did drink often, but it was hot, my stomach was nervous, and I couldn't bear the thought of ingesting anything more than water and a couple sips of Gatorade at the aid stations for quite a while. Still, the running was going pretty good at that point. So. We ran and ran. 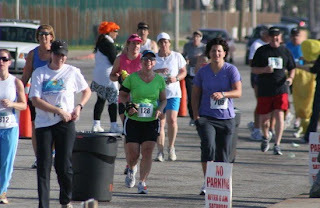 It was nice that there were always a lot of runners around us - I love that about big races! There is a huge sense of "we're all in this together" and I've never experienced it so much as I did in this race...something about knowing that we all are trying to run 13.1 miles really brings everyone together. The aid stations all had themes and everyone was really friendly and encouraging as they gave us our hydration (and offered PowerBar Gels - I didn't take any, though). A couple of things were bugging me - one, the zipper on the pocket of my hand held bottle (that I had my lip balm and my fuel in) was giving me trouble and I pretty much needed both hands to zip it back up, which was a pain considering it was slipped over one hand. I kept getting into it to get my lip balm. Wish my shorts had a pocket for that. The other thing? I wore a pair of compression liner shorts under my regular running shorts - figured that might help with the comfort/possible chafing issue on this long sweaty run. I wore them the previous week for the 6 mile run and they felt fine, but on this run, they bugged me and every time I approached a porta-potty, I debated running in and stripping them off. 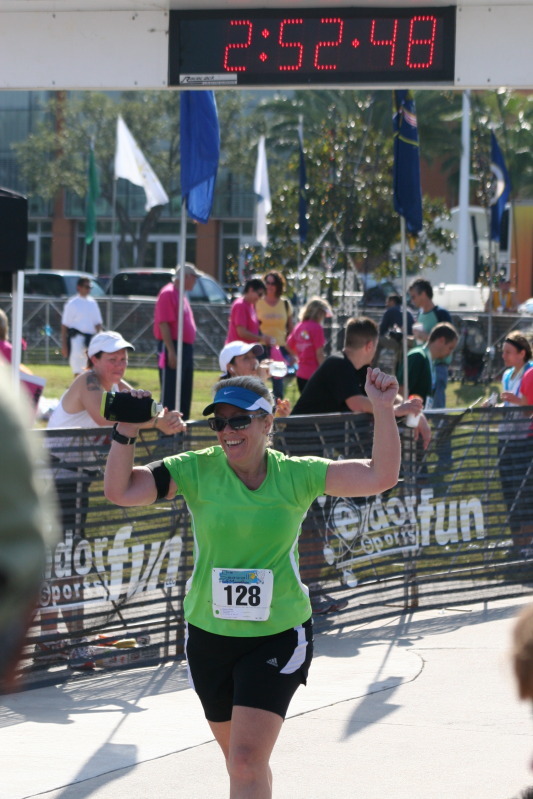 Although the lines weren't long for the porta-potties, I never wanted to take the time to change, so I just suffered through them for the entire race. You try and test out every possibility during training to avoid something like this happening, but it did. Oh well. This is when I spotted Kelly, holding a bright pink sign with MY NAME ON IT!!! And she was ringing a cowbell - love it! KELLY!!! I was never so happy to see her smiling face! Poor Kelly - I ran up and gave her a big sweaty hug. I think I even hugged Chuck, too - seeing them really invigorated me and gave me a second wind. I can't tell you how GREAT it was to have personal support along the race course! I like this picture because I look happy, and I want to remember that, not how hard it was. Which is what I believe I said to Kelly as I hugged her - "this is so hard!" 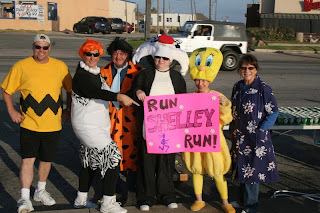 Love that she had the water station crew pose with my sign! And then we were off again...A few minutes later Kelly drove past us, honking and waving - so awesome! Coming up to mile 8, there she was again! Looking a bit less invigorated at that point, I was. Quick pose for posterity, and we were off AGAIN (say that in a Forrest Gump voice). Can't miss a photo op! So. Still running...with some walking thrown in. We would run, then walk, then pick a trash can along the route to start running again. Toward the end, it came down to either Jenny or I saying "trash can" and we knew we were going to either start running or walking...I think we need to have that printed on a running shirt - "trash can" - no body will understand it, but it has meaning. Deep, deep meaning, lol. Have I mentioned we are still running? My gosh, 13.1 miles is a long freaking way to run!!! Around the 10 mile mark, Jenny got the look in her eyes that I've seen many times during our workouts - the one that says "let's just get this over with as quickly as possible" - and she decided to try and keep running when I took another walking break. No problem - we all have to get through things in the way that works best for us. We were getting close to 83rd St., where we would finally turn off of the Seawall and start making our way toward Moody Gardens. At that point, I could hear an ambulance in the distance, coming our direction. The traffic was backed up, thanks to us runners and the nice policemen stopping the cars so we could cross the street, and it took a few minutes for the ambulance to get up to us. Just as it was approaching, the woman running behind me called dibs on it! I had to laugh - it was good to know that everyone was suffering through the heat! And apparently that's why the ambulance was called - the heat really got to a couple of runners. Hope they were ok.
And I knew it was almost over. 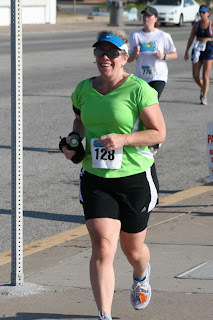 As I ran around the back, I could hear the announcer calling out names as they crossed the finish line, and I was so happy to hear Jenny's name called - I had about a quarter mile to go at that point. 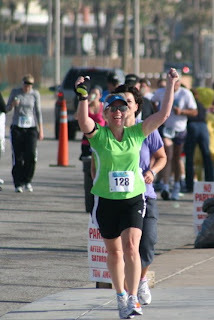 I rounded the bend and saw almost everyone from my running club, clapping and cheering me on - woohoo! And then I heard my name called over the loudspeaker - I was FINISHING MY FIRST HALF MARATHON!!!!! You can see Kelly in the picture, still holding my pink sign! Ricky Bobby says I finished the race in 2:47 - not too far off my anticipated time, and not bad considering the heat. Just past the finish line - Boy Scouts handed out Otter Pops, and then I was handed a bottle of water, but where was the medal?!? Finally another Boy Scout handed it to me...but didn't put it around my neck, and my hands were full of the other stuff! Luckily Kelly appeared and put it on me, which I think was most appropriate considering she was the one who talked me into doing this race in the first place! I like this picture because you can see Jeff and Kelly reflected in my sunglasses. Then I found the grass and sucked down an Otter Pop - great post-race treat! Jeff kept trying to get me to drink water, but I was all about the frozen treat! She had a necklace made for me that says "13.1" on the copper disc and "Seawall" on the silver disc - such a thoughtful, sweet thing to do, and everything just hit me at that point. I was a blubbering mess for a bit after that! l. to r.: Coach Joni, Tracy, Brian, A.J., Darrell, Doug, Coach Dale, me. 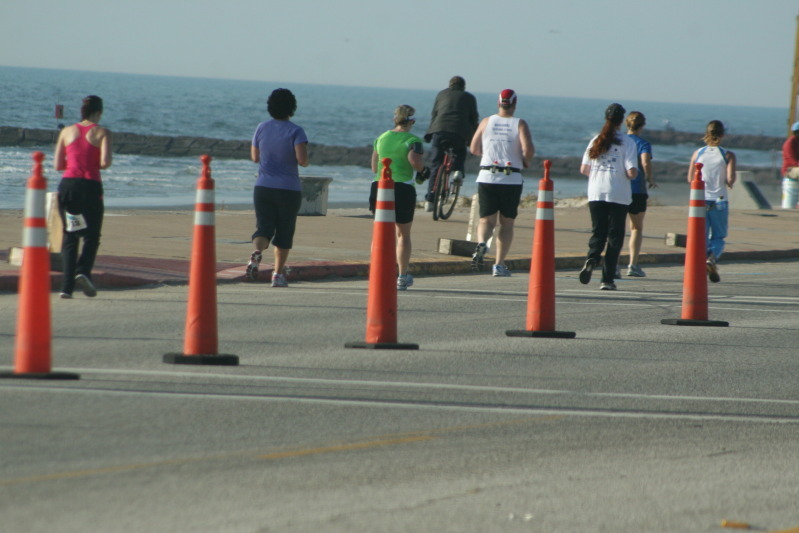 The weather conditions in this race were so similar to our 12 mile "death march" run that we dubbed this the "Galveston Death March" - affectionately, of course! 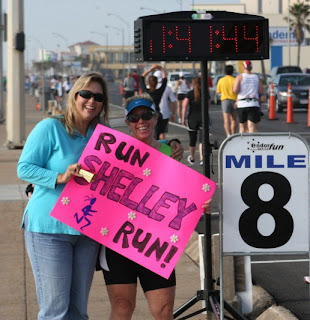 From driving me to Galveston, to getting me to the starting line, from all of the photography and making sure I had everything I needed, thank you - I couldn't have done it without you! Isn't it fun to be able to look back at this time? There's something to be said for first races - there are no expectations, no knowledge of what is to come, and no desire but to finish. I think sometimes running experience can actually mess with us vs. the innocence of a first race! 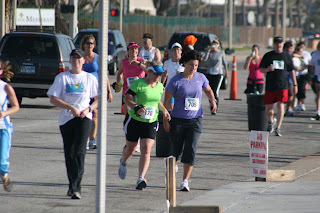 so fun to look back--Jeff wasn't even running at this point! And you were nervous but you don't seem to have the extreme anxiety that you sometimes have now. But you still had a great social support system! No, the extreme anxiety wasn't a factor back then. In so many ways, I wish I could go back to this Runner Shelley. I remember this so much. I was thinking about you all day that day. Jeff wasn't running back then, you got him hooked on it too. And Brian, is he the same Brian of your present group? I believe those were my first pair of running shoes, aka my Forrest Gump clunkers, LOL!